Notions of Switzerland conjure a rustic landscape dotted with dairy farms and mountain vistas. Yet this compact nation encompasses even more than you might imagine. The cities of Switzerland are versed in four distinct languages and diverse regional cuisine, as well as offer endless outlets for outdoor adventures. A Grand Tour of Switzerland, which encompasses 1,000 miles in a single Swiss Travel Pass, offers the opportunity to explore each region’s unique charms in one seamless journey. Tucked at the confluence of the Rhône and Arve rivers near the French border, Geneva’s international flair balances perfectly with uniquely Swiss traditions. The city has a stamp of world influence and humanitarian history evidenced by its nickname “the capital of peace.” Both the International Red Cross and Palace of the United Nations are headquartered here. Also well-known for its timepieces, the Patek Philippe museum showcases exquisitely crafted clocks and watches produced by master horologists dating back to the 16th century. The Flower Clock, located in the English Garden, is a beacon of Geneva’s watchmaking acclaim, comprised of 6,500 blooms and an eight-foot hand that tells time with trademark precision. The heartland of Bernese Oberland is home to Gstaad Saanenland, a year-round favorite among jetsetters seeking powdery ski slopes and summer mountain adventures. In the pedestrian-friendly village of Gstaad, you’ll find luxury shopping, posh chalets and wellness outposts inspired by the backdrop of rushing streams and forested hills. Kids travel for free on the town’s lifts and cable cars, leading to family-friendly adventures like a toboggan ride on the Alpine Coaster, which swishes 19 feet above meadows painted in velvety green. Families can learn the art of Alpine cheese making at a local dairy, then sample some of Switzerland’s finest fondue at Saagi Stübli in the Hotel Gstaaderhof. Another homage to Swiss food, Michelin-starred Chesery occupies a former cheese dairy and stuns with a sophisticated menu of seasonal dishes and decadent desserts — try the locally-sourced veal steak, and finish with a chocolate soufflé made to order. Journey into central Switzerland via Lucerne, an adventure-seeker’s paradise thanks to the impressive peaks that wrap around Lake Lucerne. Sail shimmering waters on a paddlewheel steamer, or dock at Rütli Meadow for a scenic stroll along Swiss Path trails. Pause to admire heritage landmarks like the miniscule Beroldingen Castle and William Tell’s tiny chapel, decorated with colorful frescos detailing the story of the Swiss national hero. For a breathtaking adventure, wind up the face of Mt. Pilatus on the world’s steepest cogwheel railway, traversing alpine flower meadows and glittering mountain streams. 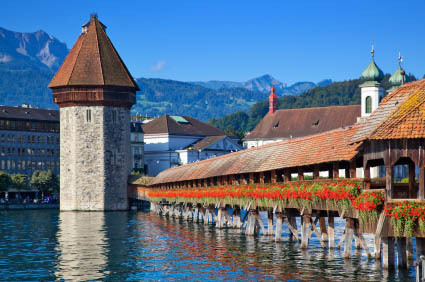 Walkers can easily explore Lucerne’s city sights — don’t miss the Chapel Bridge, one of Europe’s oldest covered bridges and a medieval masterpiece adorned with painted gables. Climb the Zytturm tower to hear the city’s oldest clock chime on the hour and soak in the view of saw-toothed ridges as far as the eye can see. The cantons of Appenzell Innerrhoden and St. Gallen, on the doorstep of the Austrian and German borders, are off-the-beaten-path sanctuaries of Swiss tradition. Spend the morning hiking the picturesque Alpstein — a mountain range sprawled across the area, dominated by 8,200-foot Mount Santis and dotted with 27 alpine inns. Arrive in time for lunch at Äscher cliff restaurant, carved directly into a vertical face that overlooks a plunging valley. Enjoy the iconic Swiss rosti (a patty of fried potatoes) before descending into Appenzell village on one of six aerial cableways. Here, charming lanes are bustling with small boutiques adorned with painted frescos. In autumn, the streets fill with costumed locals leading a parade of cattle, culminating with the crowning of the loveliest bovine beauty. Intersecting the southern side of the Alps, just north of the Italian border, tropical palm trees and lush chestnut forests lend Ticino a unique Mediterranean flavor. Ticino’s regional cuisine offers a Swiss flair to classic Italian dishes like polenta and risotto. Risotto ticinese is ubiquitous — served in both upscale restaurants and festival-season booths in the town square — often prepared according to tradition using Switzerland’s only natively-grown rice from Terreni alla Maggia farm. Taste Osteria Carletti’s version as you dine under a flourishing grape arbor, or try creamy risotto accompanied by luganighe (pork sausages) in the city’s cozy grottoes. Balmy weather also provides the ideal climate for trekking amidst 2,000 miles of hiking trails that wind along the shores of Lake Maggiore and ascend hamlet-inhabited mountain passes. Follow a former mule trader’s route through the Valle Verzasca for a collection of 30 unexpected trailside sculptures. Whether you prefer to stroll the wine trails of Lavaux with private cellar tastings along the way or dine on spätzle in a family-run chalet after a mountain hike, contact us to craft your uniquely Swiss experience using our insider knowledge and expertise. To get more details for these vacations, offer ID’s can be entered at the top of any page on our website (www.countrytravel.com). This entry was posted on June 5, 2015 by townandcountrytravel in Travel Tips, Trips Worth Doing and tagged switzerland; travel to switzerland; swiss alps; zurich; geneva; lucerne; interlaken; glacier express; scenic train; zermatt; matterhorn.